For the past week and a half, I have for the most part been living the life of a single woman, as Husband has been flitting back and forth between Copenhagen and home. I am ridiculously jealous, as I always am, because I love Copenhagen and because he’s gone and eaten at my favourite eatery – Halifax. I bloody love Halifax; it’s so unfair. Copious amounts of shopping. I seem to have an inability to leave my damn debit card in my purse. The Marks and Spencer beauty hall has taken up a lot of my time, and I managed to snag a Bliss Sinkside Six-Pack for FREE last week even though the offer had expired (it seems that no one had noticed…) which will be brilliant for my road trip. I’m a bit indifferent about the Bliss Steep clean pore purifying mask I bought which is a shame as it’s so freaking expensive, but the Super Minty Soap’n Scrub is lovely. Really refreshing. I’ve done a fair bit of spending in Waitrose, but mainly on dinner which is fair. Also, I accidentally bought the Yes to Carrots Exfoliating Cleanser which is really nice. I thought it was a face mask (what is it with me and face masks?) but it was still worth buying. 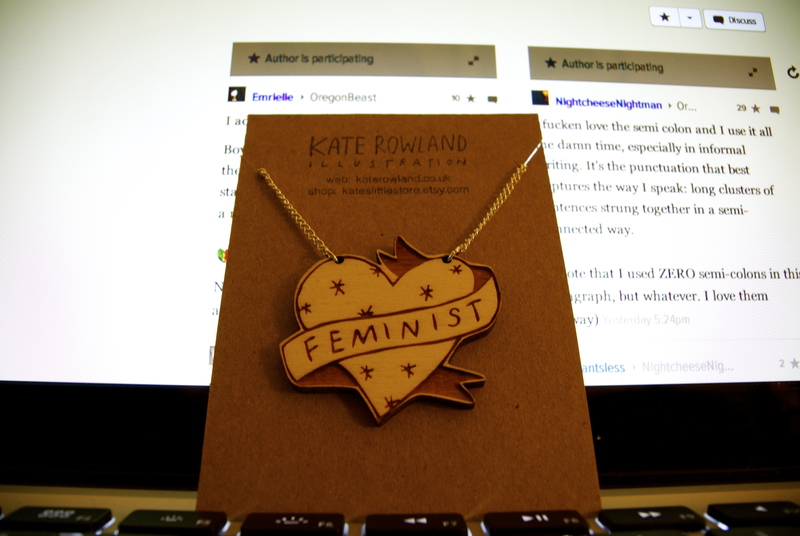 Etsy has come up trumps for me this week as well with a gorgeous Feminist necklace from Kate Rowland Illustration. Isn’t this absolute perfection? Photographed in front of a very lively discussion on Jezebel about favourite punctuation. YES! I want pretty much everything in her shop, including things pertaining to pop culture references I don’t get. This necklace is going to be perfect for the roller derby I’m going to next week. OK, I seem to be turning into a stereotype now. I was going to say that I’m proud that I haven’t spent any money today, but I’ve just remembered that I stopped off at Boots on the way home and bought hair dye. Clearly I’m starting to lose time whilst shopping. Oh well, I’m off to eat some pasta and watch Glee. ← Happy birthday to my Dad! I thought New Directions were better than the Troubletones – I hated all of the songs everybody sang though. And the Troubletones dancing was worse than ND therefore ND deserved the win. Also I don’t like Amber’s singing style so that didn’t help their case. It was a very poor Sectionals all round. I’m assuming the Troubletones did Adele though, so they should have won. It’s certainly no season 1 or 2 Sectionals. Standards slipped! I particularly hated that Adele mashup though. I think due to the Rumour Has It part. I’m pretty sure I’m going to push season 3 out of my brain again. Except the Blaine parts.